OMG ...... I’ve think I must have died and gone to heaven ..... !!! So what did I find out from my 19K+ steps and 8-1/4 mile day at Carowinds? 1). It would have been deserted if it hadn’t been for the bus loads of school kids that arrived after 10am. 2). Magic Kingom parking lot 1/2hr before the park opens ... absolutely jammed packed with a mass of humanity already at the front gate. 3). 4 front seat rides on Fury 325 almost definitely puts this on top of my all time coaster list. The jury is still out until I ride The Force again in a couple of weeks. 4). Steel Vengeance has got to be one hell of a coaster to beat out Fury 325 !!! 5). WTF is Nighthawk trying to be ?? 6). Hurler has some of the most comfortable seats on a wooden coaster I have ever been on. 9.) It’s a great family park ... loved it. Surprised you didn't like Afterburn. It has a very similar layout to Montu (only other invert with a batwing element), just more compact and more frenetic pacing. I know a lot of people prefer Banshee, but I still love Montu, especially when it was operated without the added trims and the croc pool just before the lift. I still think Leviathan is better than Fury 325 as I indicated in my original review of the coaster on media day in 2015 (http://www.themeparkinsider.com/flume/201503/4483/). I had ridden Canada's biggest coaster the year prior, and a number of other coaster aficionados at the event had a similar take. It's hard to compare with I-305 (which I also prefer personally) since Kings Dominion's biggest coaster is more about high speed maneuvers and intensity, not airtime. You're not going to "grey-out" on Fury325. Nighthawk, formerly Borg Assimilator and Great America's Stealth, was the world's first flying roller coaster. It still has some of the flaws that Vekoma fixed in subsequent installations, but did not solve the flying coaster dilemma as well as B&M did. I really like Carowinds as an overall park, but as you've noted, the layout can result in some serious walking, even though it's not the most sprawling park. Canada's Wonderland has a similar layout, but at least it has a bit of a loop to it with rides more evenly spaced. I tried Afterburn again today and it’s the 2 elements late on that seem to jerk you in an thru instead of being smooth transitions. Montu and Raptor don’t have that jerkiness, although as has been mentioned here before, Montu loses that all out aggression towards the end, whereas Raptor and Afterburn keeps the intensity up. Maybe I’ll move Afterburn up over Nemesis Inferno, but it’ll have to stay 4th in my list of inverted coasters ridden. The usual chat about back or front was common, and someone made what I thought was a perfect solution ... first half front .... 2nd half back. And I think that sums up Fury pretty good. Still not going to decide if Fury is my new #1 as KI and CP are still on the horizon, and I don’t remember MF ‘letting up’ like Fury does on the home stretch ?? Just going back in for the last few of hours as they are open till 8 tonight. I never got to ride Intimidator this morning so I’ll head there and walk clockwise round the park. I’ll do my 10 musings later. Just wanted to clarify the “turn for home” on Fury 325 ... it’s the 360deg braking/slowing down curve after the last big air time hill. MF is still going like a bat out of hell as it zips by the station. 1). Never go to Carowinds on a school festival of music Friday..
3). I haven’t seen a pair of Mickey ears in 2 days ... plenty of bouncing basketballs though. 5). It gets to 90deg in Carolina as well. ?? .... and I was hoping for some cooler temps ! 6). What’s so famous about Chickie’s & Pete’s famous Crabfries ... ??? 9). Can the 2nd row on the Intimidator be considered maybe 1/2 a front row seat ? Have to admit that I love the fact that was a highlight for you :-). I haven't yet managed a visit to a Cabela's store... Though I did get to enjoy the Bass Pro Shop in Springfield, MO before BP became ubiquitous, even in Orlando. Funny story about that... My husband and I stopped into the BP store up the road from Universal Orlando just to kill time on one Horror Nights trip and ran into a British guy who was amazed at the amount of guns and ammo that were available for sale. You must have been in my local Bass Pro at the top of I-drive ? Although I must admit I do like Cabela’s more than BP. I just hope now they are owned by the same company they stay with their regional services and goods. Maybe tomorrow (Saturday) I’ll drop by, but I’ll see how my last visit this trip to Carowinds goes. I can’t believe I’m driving by it and not yet visited .... !! 1). The little Quality Inn I stayed at was clean and tidy, but could do with some modernizations. If (when ??) I return I’ll stay at the Comfort Inn which is on the same side of Carowinds Blvd as the park, and only a 10-15min walk away. 2). Does anybody ever get to the top of the ladder climb ... ? 3). The beef brisket sandwich at Harmony Hall was superb. 4). 400+ photos so far ... and I’ve only been to 1 park !!! 5). I drove out about an hour to visit Crowder Mountain State Park this morning. If you visit Carowinds and like hiking, then the park is definitely worth a visit. They have some really great trails, and all are well marked. Recommended. 6). Ah yes ... Cabelas :). Excellent store, although much smaller than those in Portland OR, and Dundee MI. I still spent an hour and a half in there though. 7). The vast majority of cars in the parking lot at Carowinds were locals ... the vast majority of cars in any of the parking lots in Orlando are tourists ?!?! No surprise, but it’s great how well supported the park is by the Carolina residents. 8). So I learned one big thing ... Thursday, Friday & Saturdays in May are Festival of Music days, and on each of those 3 days there were between 20 & 40 buses in the parking lot. So be warned if you visit Carowinds in May. 10). Kudos to Carowinds ... despite a near deserted park, they were running 3 trains on Intimidator and Fury, and 2 trains on Afterburn. No wonder I loved this park ..
Next stop .. Kings Island .. in the rain ??? ..... another new theme park in the books, and a few more rides to add to my list. So how did Kings Island do vrs Carowinds... ?? 2). So that gave me plenty of time to decide which was my #1 at KI ..... but when it came to it I couldn’t separate Banshee and Mystic Timbers. Both great coasters in their own right. Maybe, just maybe, MT shades it ... despite the shed. 3). Ah yes ... the infamous shed. I won’t say too much as I don’t want to spoil it for those who haven’t ridden it. But I did see all the endings, which became the goal for today. The more I rode MT, the more I began to put the story together. Certainly my new favourite woodie. 4). I did ride the Beast 3 times, but that helix after the 2nd lift hill really beats you up, and at my great age it’s something I try to avoid ... :). A great woodie though, but is it better than Mean Streak in its heyday ?? 5). Diamondback was my other multi re-ride, but imo Intimidator is much better. It’s OK, and that’s as fair as I can be. All other rides were only 1 offs. Nothing drew me back to those. 6). Some things I’d forgotten about Ohio (and other northern states I’m sure ?) .... potholes in the roads .... Canadian Geese!! ... Robins ..... Tim Hortons. 7). The train and Eiffel Tower are great places for some excellent photo ops. 8). The restraints on Banshee are the best I’ve ever used on an inverted coaster. It’s an awesome ride, and the ‘floater’ in-line twist at the end is just superb. 10). The Best Western I stayed at was located perfectly for access to I71 and a quick run north to KI. There isn’t much that’s closer unless you stay at the Great Wolf lodge for a lot more per night. Plenty of eateries around the hotel as well, so all in all I would stay here again. It’s 6 miles from hotel parking lot to KI parking lot. I’m going to cheat and add one more .... 11). I really liked the way passholders can go down separate car lanes and scan their pass to get in very easily. Orlando theme parks take note !!! I like the Banshee restraints too, but a lot of folks really despise them because the vest ratchets up in the middle of the ride and keeps getting tighter and tighter. Most complaints come from larger guests, but I've seen some smaller guests annoyed by the design as well. I don't know why, because the design is very similar to the restraints used on the B&M fliers (they're on Valravn too), and for whatever reason, over-tightening never seems to be an issue on the fliers, perhaps because most have a pretzel loop near the beginning of the course that pins you to the back of the seat and having that restraint tighten after that feels comforting. I'm mixed between Diamondback and Intimidator. I feel Intimidator is very repetitive, and that the hammerhead tunraround is a waste compared to the diving helix on Apollo's Chariot. Diamondback had a hammerhead too, but it feels more forceful than Intimidator - closer to Nitro. I would put these 2 neck and neck, but if we're talking just about B&M hypers (not gigas), Apollo's Chariot, Mako, and Nitro are all better than Diamondback and Intimidator (Raging Bull and Goliath at SFoG are probably at the bottom of the barrel). Behemoth is probably pretty close to Intimidator and Diamondback also. I didn’t have any issues with the Banshee restraints at all, and I must have rode it 12-15 times. I even tried the back, and all was well. But I haven’t quite worked out yet why people ride inverted coasters in any other seat than the front. I’ve tried most of them in different seats, and I always end up in the front the next ride round. For me the issue with the other inverted restraints is I get such an ear bashing as I’m just at that height ... :(. It gets to be painful, especially if wearing glasses, when riding multiple times. It’s a pity Cedar Fair didn’t do a Sheikra with the water plume on Diamondback ... although it’s a bit different getting soaked in Florida compared to Ohio ?? But anyway ... Saturday I head for CP, so Steel Vengeance gets ever closer. Weather looks lousy for the late pm and evening, so it looks likely I’ll be in line at the Magnum entrance early Sunday to make a dash to Frontiertown. Should be a fun 3 days. I never been a front seat rider. I love g's and airtime, so I've always gravitated towards the back. I rarely find that the visuals on a coaster trump the forces. I can see the argument for the front seat on inverts, but I've always thought it was more exciting to not see what's coming up. 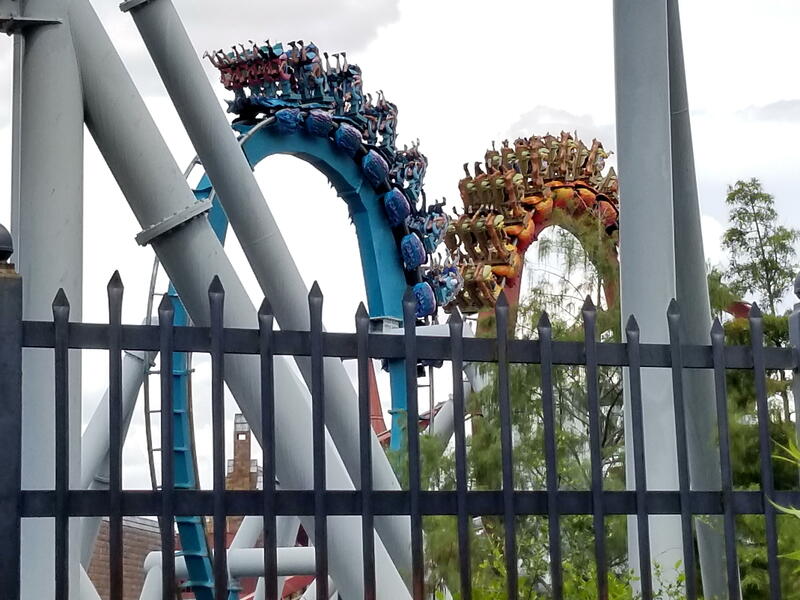 B&M's are so smooth that it's not like you have to brace for anything (like on a Vekoma SLC). The positive g's at the bottom of a hill or loop on an invert are pure adrenaline for me, and the prettiest scenery in the world wouldn't sway me to ride in the front (plus the lines are always 3-5 times longer depending on how they're load - I know Banshee loads a little different when ride ops are on their game, shortening front row waits to about 2x of any other row). I've always thought that if you ride a coaster enough, you know it by heart, so seeing where you're going doesn't matter anyway. I've probably ridden Alpengeist hundreds of times, and can recite that layout by heart blindfolded, so the front seat there is worthless to me. Good luck at CP. Maybe SV will no longer be single training. 2). ...... and when they got there SV wasn’t working anyway. I think it was closer to 10 than 9 before people started to board the ride. 3). ..... in that time I’d ridden Millenium Force 3 times, and was on my way to a still relatively quiet TTD. 30 min wait and that was the front seat. 4). 60deg is way too cold for late May !?!? Bloody freezing actually. At least it didn’t rain, like it has been for the past week in Orlando. 6). The new eatery, Melt, is v good and recommended. Pricier than the surrounding places but great food. 7). I thought the restrooms were in a poor and dirty state. I can’t remember ever thinking that in previous visits. 8). Did I mention it was cold ?? 5 layers, 2 of which were thermals and I still felt cold. 9). No Mickey ears yet ... thank goodness. But I did see 2 Disney backpacks today. And saying that, makes me wonder ... what do people carry in their backpacks ?? I mean, they are jammed packed full ?? 10). And that’s it for now ... Next time is decision time ... The fight for my (new?) #1. In the 4 corners are .... Millennium Force; Maverick; Fury 325 & Steel Vengeance. Glad to hear you survived your first day at CP. Nine+ miles- doesn't surprise me. Yes, it was a bit colder than normal today, but since I spent the day mowing and gardening it felt pretty good. Melt is terrific- I think their Monte Cristo is better than Blue Bayou's at DLR, and I love all the old ride memorabilia on the walls. I'd be surprised if you see any MM ears, but I have seen Snoopy hats with his ears, and usually see a few of Charlie Brown's yellow shirts with the black zig-zag design. Something else you won't see much of at Cedar Point that are everywhere at DL and WDW- strollers. Between the scarcity of them and the wide pathways at CP, I've never had my heels run into. The bathrooms- that's a hit or miss, but absolutely you should have stopped at Guest Relations and reported it. Glad to see that CP has 3 of the 4 in the running for your #1. I wish I could make it up there while you're visiting to give you one of my boring Cedar Point history lessons- there's a lot of history in a 148 year old park! Have a great time! Maybe next time I’m here, you can give me your history tour. That would be great .. thx. Almost definitely in 2 years for the 150th party ... what will they do to top Steel Vengeance ? Good point on the strollers ... never thought about that until you said, but 100% agree. It’s hard work with Steel Vengeance running only 1 train, but 2 rides in the front and 1 in the back so far have given me a good insight into what the ride is all about. Gatekeeper- one of the smoothest coasters in the world! If you haven't already, ride it four times, twice on each side, once each front and back. It's like 4 different coasters. Don't bypass Cedar Downs. It's not just a fast carousel! Great, unique, fun, one of the last racing derbies in the world. From what I've heard they've shortened the safety belts in Wicked Twister to the point that only someone who is EXTREMELY thin can ride it without being stapled into the seat, or facing the walk of shame. If you have a chance, sneak up the stairs on the Kiddie Kingdom side of the Colosseum (the big building with all the domes and the arcade on the ground floor) and look in at the Cedar Point Ballroom. It's huge, and one of the best examples of ballroom art deco decoration in the world, redecorated back in the 1930s. Just open the glass doors and walk in- usually nobody is around, and the worst I've had happen is they asked me to leave because of some event being set up for. I came to Cedar Point when the Gatekeeper opened and did all 4 corners .. left front is my favorite. I’ll definitely do the corners again today or tomorrow. Although since my trip back to the homeland last year, The Swarm at Thorpe parks takes the #1 spot for my winged coaster rides. I plan on going on the Cedar Downs ride again. I haven’t been on it since we left MI & headed for FL. I succumbed and rode SV this morning. Not quite the mad dash as yesterday, and when I got there it was only a 45min wait, so not too bad. The 1 hour ERT is still on for tomorrow night, so I’m hoping to get a few more rides in before I leave for warmer climes on Wednesday. I’ve just had my other half of the Melt sandwich ... awesome :) and heading back in. It’s nicely populated today, and ride wait time is still in the 30-45min range .... except Steel Vengeance .. of course !! 1). If nothing else I’ve had plenty of exercise ... :). Last day at Cedar Point almost beat my CP record, but at 11 miles and 25.5K steps it fell just short. 2). I certainly needed that walking as I took James’ advice and tried the Monte Cristo at Melt. The sign of a good sandwich is you can feel your arteries clogging as it goes down .. and the fruit dip was the perfect match for the heart attack inducing Monte Cristo. One word ... superb !! 3). How long has the fast lane entrance to TTD been all the way to the station ? 4). 4 corners on Gatekeeper is the only way to appreciate what a great coaster it is. 5). I still prefer Shiekra over Valraven. 6). I bought the fast lane+ on Tuesday. Being a platinum passholder I got it for the same price as the fast lane basic. It was worth it to ride TTD, Valraven and Maverick multiple times. Main entrance end was pretty quiet, but the closer to SV you got the busier it was. 7). Raptor still tops the Banshee, but it’s pretty close. The roar of Raptor gets it those extra brownie points. 8). My top 2 are now Fury 325 and Steel Vengeance... I’m still torn between 8 or 9 other rides to make up my top 5, so I think I’ll make them all joint 3rd ... !! 9). Next year it’s (probably) BGW, Kings Dominion and 6 flags great adventure.